Altbier is a copper-coloured, cool-fermented and lagered ale, making it somewhat of a hybrid between ales and lagers. The beer style is clean-tasting, with an aromatic hop presence, some bitterness, a firm creamy head, a medium body, and a dry finish. Flavourwise if you think of it as a California Common or steam beer made using all German ingredients, you'd be on the right track. It is one of only a handful of traditional German ales. It is quite common that we can pinpoint a beer style to a place of origin. For example, London gave us Porter; Dublin, the Stout; Burton, the IPA; Cologne, the Kölsch. Altbier is such a special beer style that can be traced back to Düsseldorf, the capital city of the German state of North Rhine-Westphalia (a loosely defined area of Western Germany along the Rhine River, near the Dutch border). In German, "Alt" means "old" - a reference to the old style of brewing, before lager existed. The modern Altbier acquired its name only in the 1800s, when this Düsseldorf original became threatened by the "new" lager beers of Bavaria and Bohemia. Before that time, in Düsseldorf, Altbier was simply called "bier". Düsseldorf ranks among the oldest inhabited places on the globe. Neanderthal, which gave the Neanderthal man his name, is a suburb of Düsseldorf. While it is unlikely that Neanderthal man ever made beer, it is believed that Celtic and Germanic tribes from approximately 3000 years ago started brewing ales from wild grains in the region. Because Altbier has evolved from these primitive tribal roots, it is arguably one of the oldest continuously brewed beer style in the world. In spite of its ancient lineage, Altbier is considered a modern brew, sipped by Düsseldorfers in the city's many ancient brewpubs and modern bars. In the city's Altstadt (old town), almost every house, many of which date from the 13th to the 17th centuries, contains a pub. There are more than 200 of them crowded together in an area less than one mile square. 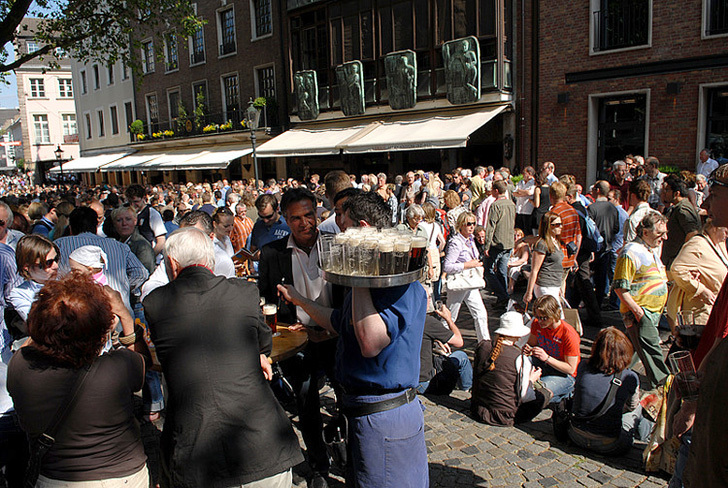 With its cobble-stoned lanes, it is known affectionately as the longest bar in the world, and it is there that you can find four of the eight Düsseldorf pubs that brew Altbier on premise: Uerige, Füchschen, Zum Schlüssel and Kürzer. All of these pubs brew and serve just the one kind of beer so there's never any question as to what to drink. 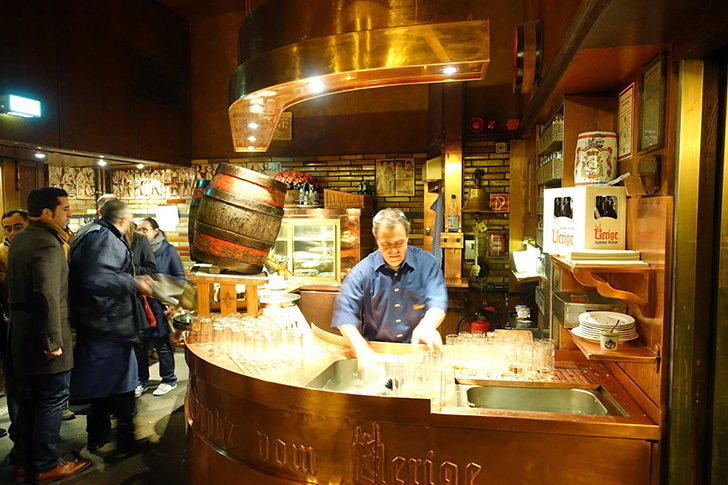 Düsseldorf Altbier is served straight from wooden casks that are rolled out from the cellar by foot and then tapped and poured on-premise using a simple faucet. Dispensing is usually done without CO2, by gravity alone. Similar to Kölsch, once you have been served an Altbier, the coaster under the glass serves as a tally for the number of beers consumed. The only way to stop your glass from being replaced is to place the coaster on top of the glass, which tells the waiter that you are done. 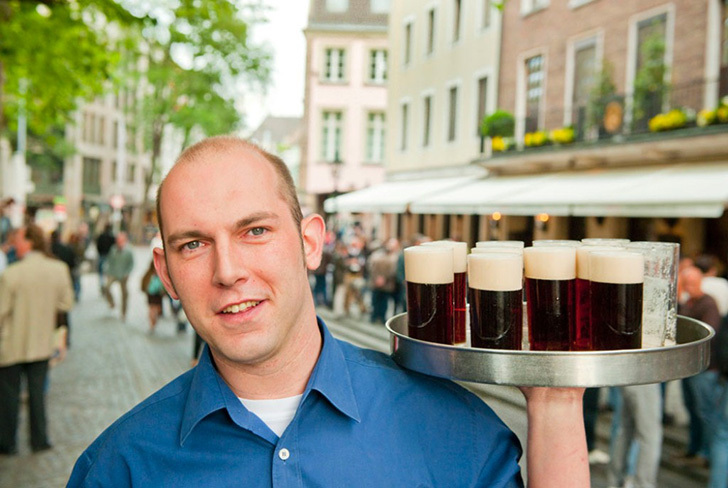 The waiters carry revolving trays of Altbier while collecting empty glasses on the fly. The waiters will occasionally pause to enjoy an Altbier at the customer’s expense, usually finishing it in one or two gulps. Altbier is typically served in tall cylindrical 0.2 litre (~6 oz) 'becher' glasses which are similar to Kölsch 'stange' glasses, although slightly shorter and fatter. The idea behind the small glass is that the beer stays fresh and cold as it doesn't sit around for long. In the mid 20th century, there were around 100 Altbier breweries while today less than ten remain. 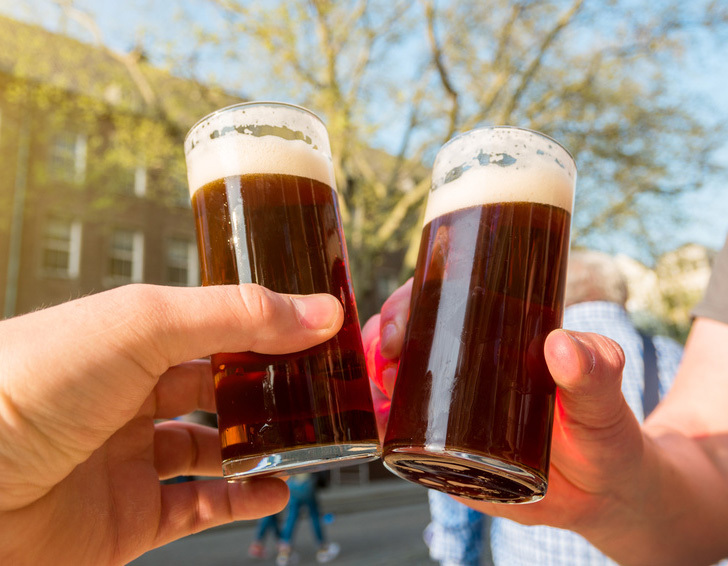 Today in Germany Altbier has a small market share between two and three percent, but on its home turf in Düsseldorf, just about every other beer consumed is an Altbier. In the United States Altbier has become quite popular as a brewpub special. The 2008 version of the BJCP (Beer Judge Certification Program) recognized two distinct styles of Altbier: The slightly more bitter Düsseldorf Altbier shown here and the Northern German Altbier. The Northern version is slightly maltier and less bitter, but the differences can be subtle as the styles have considerable overlap. 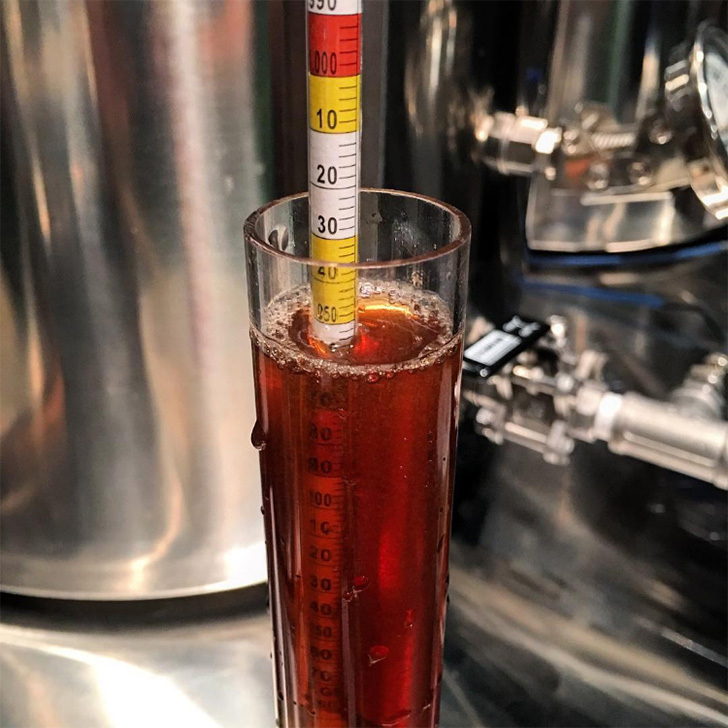 The newest 2015 version of the BJCP actually combines the two into one general "Altbier" style. A classic Düsseldorf Altbier should exhibit clean, yet subtly complex, German malt and noble hop aromas. While the malt bill and hop schedule are reasonably straightforward, it's important to use good quality fresh ingredients, such as Weyermann malt (our preference for German malts). No cooked corn (dimethyl sulfide) or butterscotch (diacetyl) should be detected. Amber to very light brown colour is typical, along with brilliant clarity and an enduring head. In regard to flavour, a crisp, moderate, German malt character should balance substantial hop bitterness (35-50 IBUs) and light to moderate noble hop flavour. Slight fruity esters from the ale yeast may persist in some examples, along with light/medium body and moderate carbonation. Original gravities of 1.046 to 1.054 are typical, and final alcohol percentages fall within 4.3 to 5.5 ABV. Düsseldorf's climate is similar to that of Britain. It rarely gets very hot or very cold, ideal for ale making. Altbiers are fermented with a specialty ale yeast between 55-65F. This yeast is critical to brewing an authentic Düsseldorf Altbier: It has to be either Wyeast 1007 German Ale or White Labs WLP036 Düsseldorf Alt, both of which are reported to have been source directly from the Uerige brewery in Düsseldorf. While you can make a great clean tasting beer using other yeasts (such as Fermentis Safale US-05), it just won't have the same flavour and aroma as a true Düsseldorf Altbier. Try a split batch yourself and see the difference the yeast makes. After fermentation the beer is conditioned/aged for one or two months at lower temperatures (like a lager), to bring out its mellow maltiness and aromatic hoppiness. We prefer to do this in the keg as the beer carbonates at a near freezing temperature. 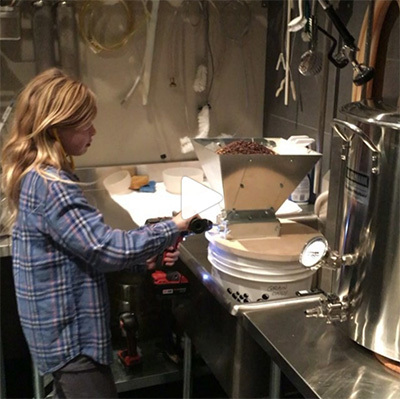 Video: Brew day helper milling grain for our Düsseldorf Altbier. 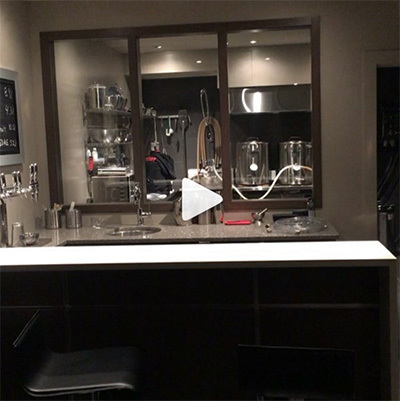 Video (c) TheElectricBrewery.com. Digging through hops in the freezer to find the Magnum I'm looking for... Image (c) TheElectricBrewery.com. 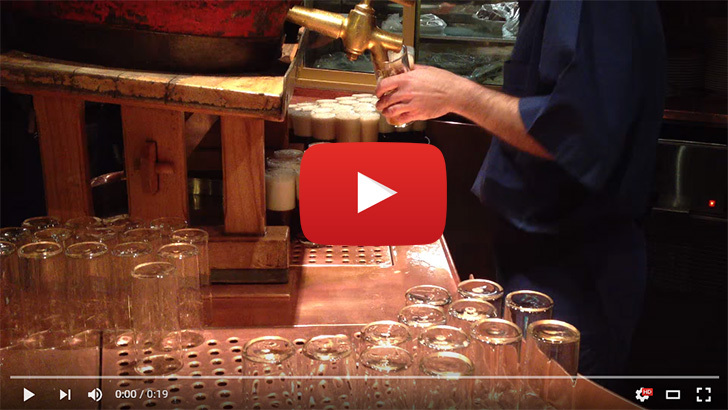 Video: Heading to the brewery to fill up the HLT to brew a Düsseldorf Altbier. Video (c) TheElectricBrewery.com. 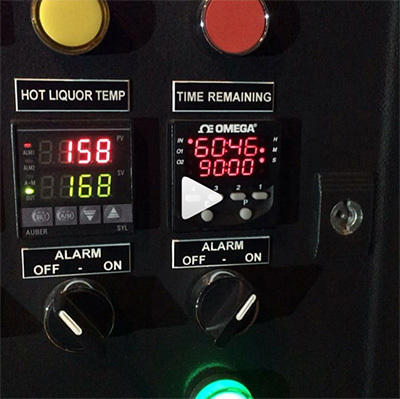 Video: 30 minutes into fly sparging our Düsseldorf Altbier. Video (c) TheElectricBrewery.com. Final gravity at 1.050 @60F as planned (our hydrometer reads 4 pts high). Wonderful colour too! Image (c) TheElectricBrewery.com. Brew up a batch of Düsseldorf Altbier and let us know how you like it! 1.25 qt/lb mash thickness. Single infusion mash at 149F for 90-120 mins. Raise to 168F mashout and hold for 10 mins. Cool wort to 58F and aerate well. Pure oxygen from a tank can help and is recommended. Ferment at 60F until approximately 2-5 points from final gravity, then raise the temperature to 70F and keep it there to reduce possible diacetyl (a buttery flavour produced by some yeasts) until fermentation is complete. This will usually take 3-5 days, but don't be afraid to leave it an extra few days. Assume fermentation is done if the gravity does not change over ~3 days. I was planning of doing something similar in a few months (I was thinking of something like the Sticke Alt from Les Trois Mousquetaires, which seems to be a bigger version of Altbier). I may give this recipe a shot. Anybody ever tried to brew an Altbier with a Kölsch yeast? Sticke Alt is a darker and stronger, seasonal, variation of the traditional Düsseldorf Altbier. Think of it as an 'imperial' version of Altbier. (It was invented by the Uerige brewpub of Düsseldorf, and is brewed only twice a year, though others do brew it now as well such as Schumacher). "Sticke" is local vernacular for "secret," which means the brewery does not reveal the recipe. Seems like a fairly common thing to do. It'll work and be tasty. You'll get slightly accentuated hop flavours with the Kolsch yeasts as compared to a 'true' Alt yeast. I'd probably bump the IBUs down 10% or so, though it really depends what you're going for. I'm using Brulosophy's idea on yeast harvesting: I am overbuilding a starter (by roughly 100 billion cells), and keeping that aside for next brew. I did that with WLP001 for my last three brews, and it went really well. I only brewed 6 batches so far in my homebrewing "carreer", but I feel that I am making progress quickly. My last batch was a slightly modified Electric IPA, and it is hands down my best brew so far. It may have something to do with the fact that it was my first brew with controlled fermentation temperature. I'm brewing a Köslch next week (your recipe...! ), with Wyeast 2565. I was then planning to do an American Wheat with the same yeast (my summer brew), and then an Altbier, or Sticke Alt. So it will take a few months before I get to this one. I am just doing a lot of research in advance, trying to grasp the "idea" behind the beer I want to brew. With so many styles to choose from and the fact that I can only brew about once a month, choices are not easy to make! With so many styles to choose from and the fact that I can only brew about once a month, choices are not easy to make! I know exactly what you mean! I usually put a TON of research into recipes, at least new ones. This might have to be my first recipe when I finish my setup in the next week or two...I LOVE this beer style. Lived in Germany the past 2 years and I had a crate on hand always! I'm on day 5 of fermentation @ 60F - OG was 1.055 and I'm currently down to 1.028. Plan is to ramp up to 70F when I hit 1.017 or so, but unfortunately I have to travel for the next 3 days. I'm assuming the relatively slow fermentation is due to the low temp - looking for suggestions to see if I should ramp it up prior to leaving or let it sit. Thoughts? Assuming you pitched the recommended amount of yeast and it’s healthy, I’d leave it as is until you get back in 3 days. It’ll be fine. You can ramp it up after it hits terminal gravity if you don’t have any other choice. Thanks Kal. Made a starter and pitched at high Krausen.... We'll see what it's like when I get back! I'm shocked there aren't more reviews here. Sure it's not a trendy new IPA or anything, but this beer is just plain good. Distinctly German. It's very crisp, dry, and light taste for it's color. Very slight caramel. This has an easy recipe, quick turn around time, and low cost. The ONLY drawback is it's a session beer that you can drink by the liter (or 2), so it doesn't last long. Glad you like it! Guess you need to make more!